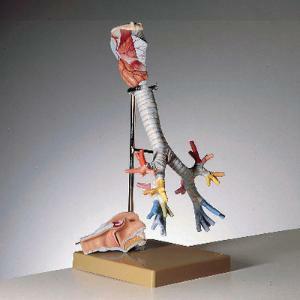 The life-size model depicts the pathway that air follows during breathing. It features the larynx, trachea with bifurcation, major bronchi, and lobular bronchi conveying air to deeper lung tissue for gaseous exchange. The larynx is bisected, and the right thyroid cartilage, cricothyroid muscle, and thyroid muscle are all removable. The larynx and trachea can be separated at the sixth tracheal cartilage.